Ellie Rodriguez boots a ball upfield for Wauseon Monday at Lake in a Division II sectional semifinal. The Indians were eliminated with a 6-0 loss to the Flyers. 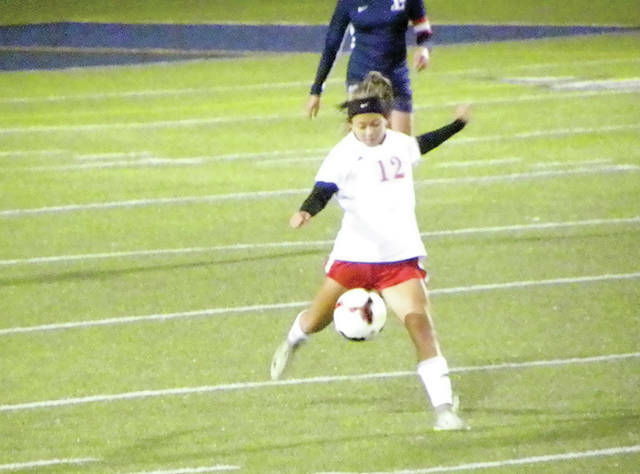 MILLBURY – Host Lake broke open a close game by scoring three goals in the first three minutes, 17 seconds of the second half to end Wauseon’s season 6-0 in a Division II girls soccer sectional semifinal at Lake Community Stadium Monday night. Trailing 2-0 at the half, the Indians found themselves in trouble when Lake pumped in three quick goals in the second half. It came just two days after falling at Lake 7-0 to end the regular season Saturday. Wauseon tried to control the ball, plus got great play from keeper Marie Hutchinson to stay in a scoreless game until late in the opening half. The Flyers scored twice in the final 11 minutes of the half, with the opening goal coming off a turnover at midfield, to lead 2-0 at the half. With the young team, Schroeder hopes the playing time will build for the future.